Sitting in traffic or waiting in line? Wasted time or prayer time? Your call. With Family Rosary's Mobile Rosary it's prayer time with Mary. A traditional Rosary with soothing audio and the text of each prayer. The Mobile Rosary allows you to dedicate each Rosary to a cause or intention. You can share your prayer intention on Facebook or Twitter, so your friends and family know you are praying for them. Also, we include an inspirational Prayer of the Day to keep you going. If you are learning the Rosary, there is no easier way than Family Rosary's Mobile Rosary. Those who pray the Rosary regularly will love how the audio guides you through the prayers. 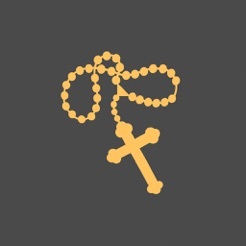 I enjoy using this app to pray the Rosary as I go about my day. However, it would be helpful if the app stayed open during the entire Rosary instead of having to tap on the screen to keep it active. I don’t have this problem using other apps. It makes it hard to pray & drive when the app shuts down after a few minutes. Thanks! Read the Bible passage and scroll down. It's there. I never listen to the app as I prefer to pray at my own pace. I do have to remember to click the pause button because the app auto advances to the next prayer independently of my manual advances. This resulted in a few 7 Hail Mary decades before I realized what was happening. App does exactly what I want it to do.